To be fair, I never met a bread pudding I didn’t like, but this one is especially good. The slow-cooker did wonders to it, turning the middle into a rich custard and the crust into a caramelized, golden bite of heaven. It was so good, I was convinced that it was just doused in heavy cream and sugar, but it turns out, it was just made with regular milk and not an obscene amount of sugar…which is more than I can ask of any bread pudding. The best part, though, is the fruit that’s hidden inside! Plump raisins, big pieces of dried plums, and sweet white peaches. You can of course, use whatever fruit you’d like, and however much of it, maybe none at all. But, I highly recommend you go with this version. I wouldn’t change a thing. 1. Slice the bread into thick pieces, about 1 ½ inches thick, and leave it out for a day or two so that it hardens up a bit. 2. In a slow cooker, add the bread and milk. If you want to be extra decadent, you can use half-and-half, but it’s not really necessary. 3. Stir in whatever fruit you like. My version (highly recommended) used homemade raisins, dried plums, and white peaches, sliced up. You can choose how much or little to put in. 4. Stir in a melted stick of butter. 5. Beat together the eggs and sugar. Pour over the mixture. 6. Cover the slow cooker and cook on low for 3-4 hours. Once a knife comes out clean, you’re good to go. Try to wait for the bread to be golden brown. 7. Top with Vanilla Rum Sauce and whipped cream right before serving. Aggressive Version: Make your own vanilla rum by soaking split vanilla beans in rum for several weeks. Ambitious Version: Mix together 6 shots of store-bought vanilla rum with 3 tablespoons of sugar, and ¼ cup of cream (or half-and-half). Gently heat it over low-heat until the sugar dissolves and the ingredients combine. Slacker Version: Melt some vanilla bean ice cream into a “sauce” and stir in some rum. You can”t stop oohing and ahhing over this one and it’s calling my name! 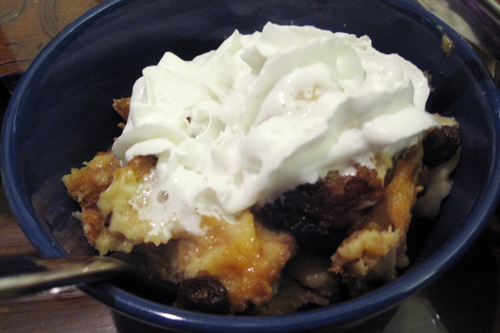 This entry was posted on June 9, 2010 at 6:57 pm and is filed under Uncategorized with tags African Way, Bread Pudding, plums, Raisins, recipe, vanilla rum sause, white peaches. You can follow any responses to this entry through the RSS 2.0 feed. You can leave a response, or trackback from your own site. The recipe sounds delicious. I can’t wait to try rum-vanilla sauce. It looks really yummy.